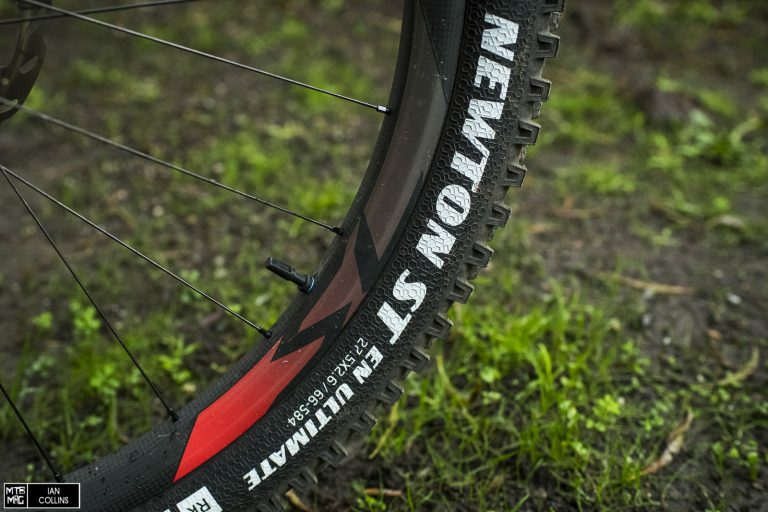 Compared to the slightly more tame standard Newton tire, the ST model sees taller knobs as well as arch-supported side knobs, which help it resist folding under hard cornering. The Newton ST is available in 2.4″ and 2.6″ widths (in both 27.5″ and 29″). We tested the latter, but as you can see above, it actually measured at precisely 2.4″ on a 30mm inner diameter rim. Regardless, the tire’s volume seemed quite good, and perhaps on a 35mm rim, they may sit a bit wider. 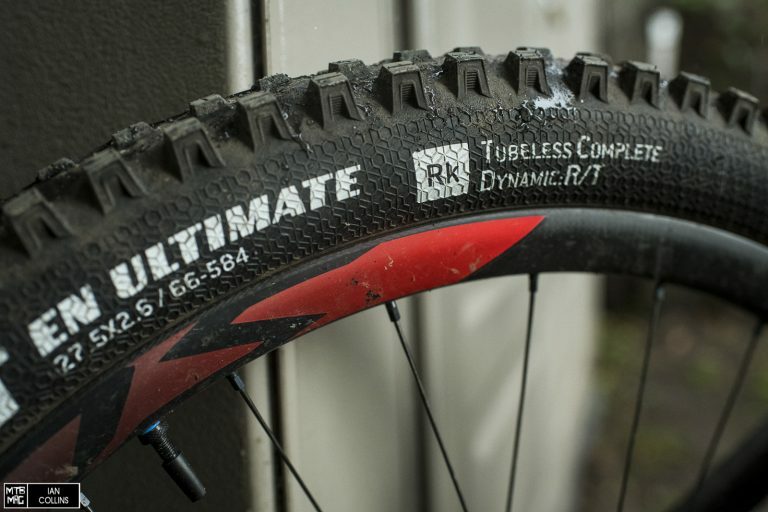 The “Dynamic:R/T” label refers to the rubber compound, which was formulated with help from Rubber Kinetics, a group who’s also been helping Ride Concepts shoes with their outsoles. The R/T compound is the second from softest in the Goodyear lineup, with the softest RS/T being designated solely for downhill specific tires. The knobs feature a fairly standard vertical sipe on the side knobs and horizontal sipes on the center lugs. This helps them have a bit of squirm and extra bite in the right direction, given their separate duties(cornering / braking). The center knobs are ramped, to improve rolling resistance, and the side knobs, while supported by arches on the inside(to improve braking in corners), are also scalloped on the outside to let them give just enough while under pressure. The EN Ultimate casing is a 1.5 ply which uses a lighter weight casing fabric than its beefier DH counterpart. 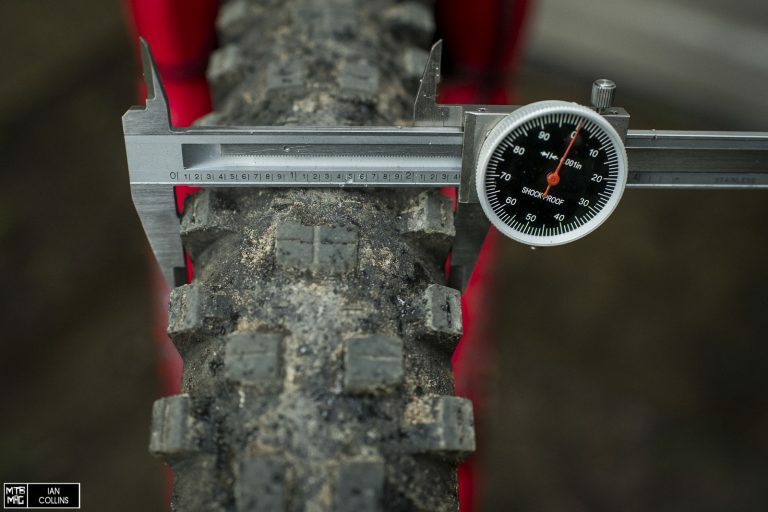 This gives it a bit more compliance, but at around 1,250 grams, it’s definitely still a tough casing which is just about right for “enduro” and aggressive trail purposes. Since most good rides start with a climb, we’ll start there. On the uphills, the Newton ST surprised us a bit as we expected it to drag a bit, given its aggressive looks. The rolling resistance was actually fairly low for such an aggressive tire; then again, the center knobs really aren’t all that tall. With that said, on long rides we could feel the weight of the ~1,250g casings. If weight is a big concern, you could always run the 100 gram lighter “Premium” casing version of the Newton RT up front and pair it with the standard Newton, or a 2.4″ version out back. In any case, the climbing(traction included), was pretty good with all things considered. On the descents, we had mixed feelings about the Newton ST. 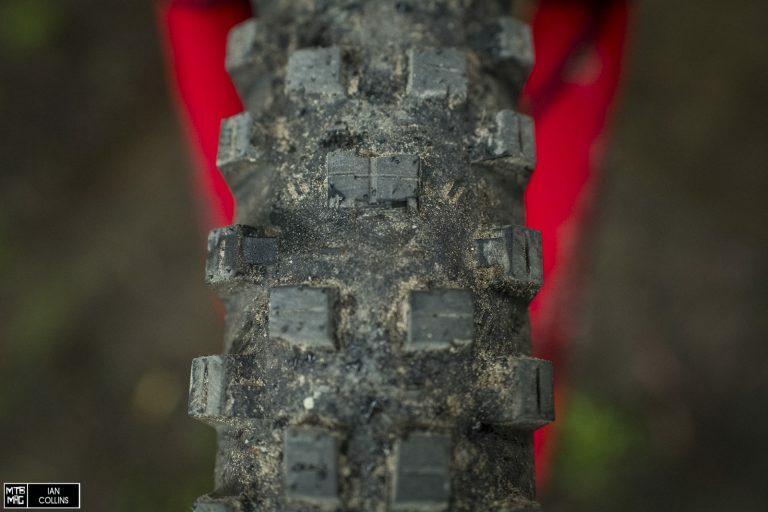 Initially, the rubber compound felt quite hard, and on the first few rides the tires were a bit unpredictable. After a couple rides, the tires broke in a bit and got more compliant, which we felt particularly at the side knobs as they softened up substantially. Our gripe with the rubber compound was not how soft they are, but the fact that they didn’t have an element that slowed their rebound. 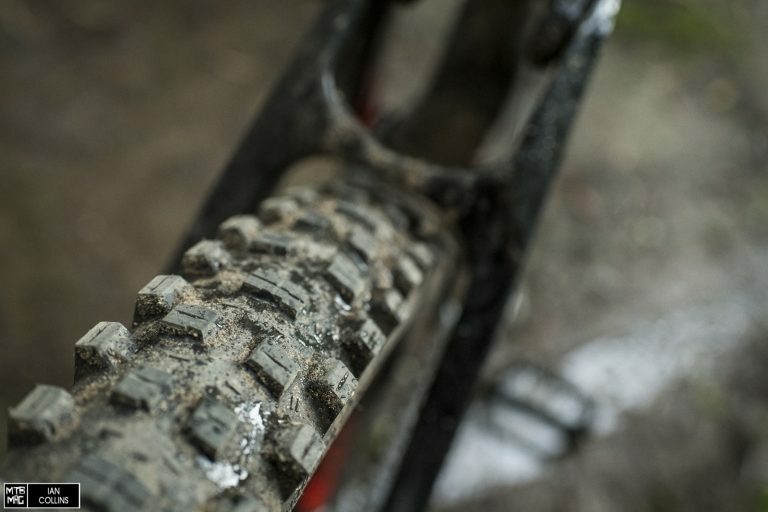 Softer tires from Maxxis, Schwalbe and Michelin have a bit of damping to them, in the sense that when you fold a knob over, it doesn’t snap right back. On the trail, this makes them more predictable and less pingy, particularly on roots and wet rocky sections. Outside of more technical terrain, it wasn’t the kind of thing we even noticed when on perfectly damp, gravelly trails where cornering and braking was actually quite excellent. This did leave us curious about the softer RS/T compound that’s designated for DH. Anyhow, in good conditions we loved the tire and found its tread pattern to be very effectively laid out while its casing was perfect for the intended purposes. 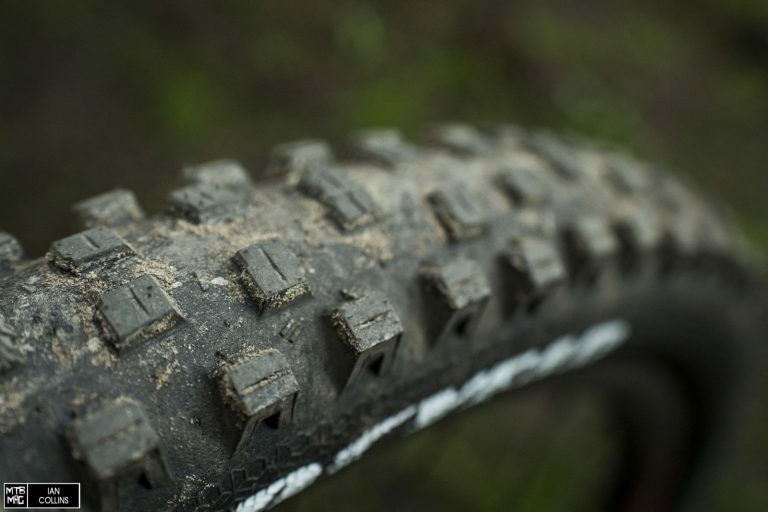 For what it’s worth, we have the same gripe with the current Specialized Butcher tire – it has a great tread pattern, but just needs a slower feeling rubber compound. 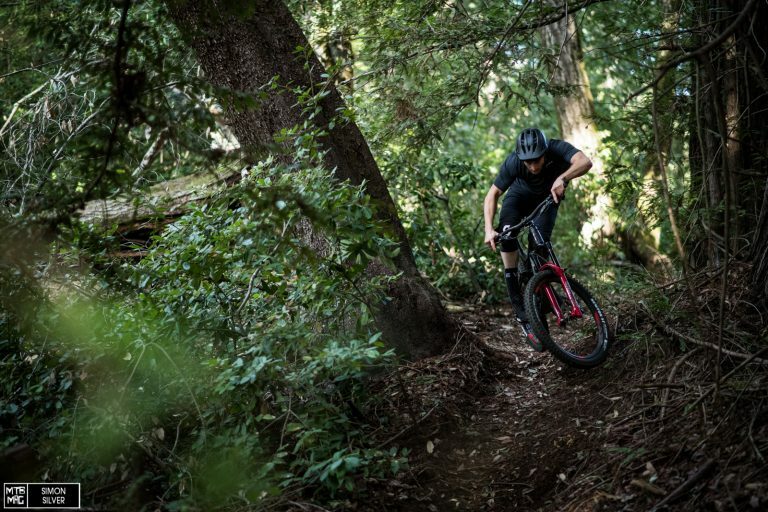 To sum it up through a consumer lens, if you mainly ride in good conditions such as loose dirt, loam, or decomposed granite, you’ll love the Newton ST as is. This also the case if you are budget minded and typically avoid softer tires in the first place, to save money. Due to their slightly snappy feeling rubber compound, they were slightly erratic in the worst of conditions, like wet rocks and roots. This occurred with absolutely no fault to the excellent tread pattern nor the tough, yet compliant casing. 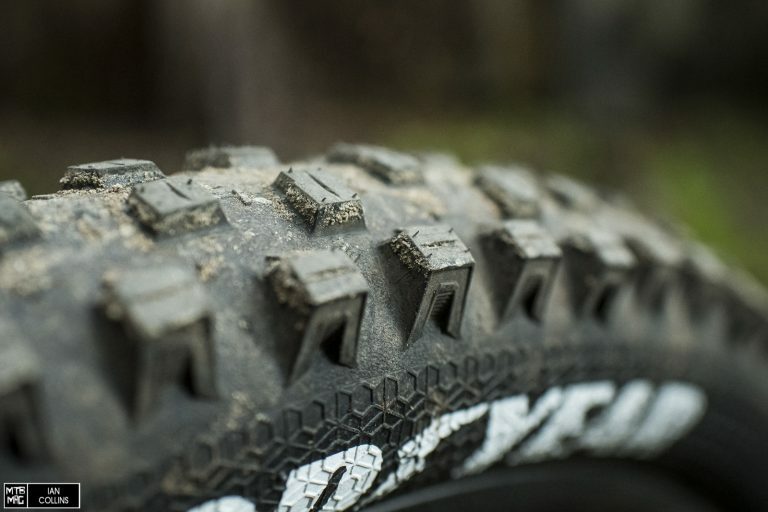 Goodyear is new to the MTB game and we think they’ve made an excellent debut, all things considered. We also feel confident that through feedback like this, they’ll hopefully make some adjustments to their rubber compounds in the future and become a major force to be reckoned with in the tire market. Industry Nine's latest hubs have a mere .52-degrees between engagement points. Hosted by On Yer Bike Cycles, come along and demo the latest bikes from Orange.